The following pictures of bridges around the world should be viewed with caution because they might cause serious travel fever. The bridges’ vital stats are not only amazing because they are the world’s tallest and longest; they also fulfill important environmental promises – cutting down traffic, shortening trade routes, connecting countries, or making car, train, bicycle or pedestrian travel not only faster but also so much more stylish! At first glance, the Water Bridge in Magdeburg, Germany, seems nothing special; just another canal bridge. But look again and it’s a water bridge across water, forming a water intersection that is the biggest water crossing in Europe! The world’s largest water bridge, with a span of 106 m between its pillars, opened in October 2003, on the back of five years of construction, 24,000 tons of steel, and 68,000 m³ of reinforced concrete. Regaining the construction cost of €500 million probably won’t take long as the bridge shortens travel times for ships considerably and eases traffic on other routes. 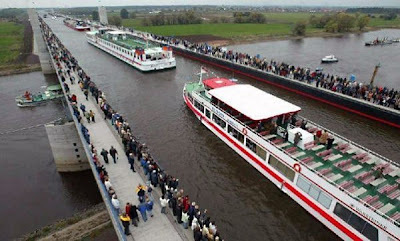 Before the opening of the water bridge, ships moving between the Midland Canal and the Elbe-Havel Canal had to make a 12-km detour through the Rothensee lock, along the River Elbe and back up Niegripp lock. Now the bridge connects Hannover and Berlin directly and also Berlin’s inland harbour network with the ports along the Rhine. A double lock was constructed to descend to the Elbe-Havel Canal and a single Rothensee lock was constructed at the other end of the water bridge to descend to the Elbe and the Magdeburg harbour, making it independent of water levels and therefore navigable even for large ships. 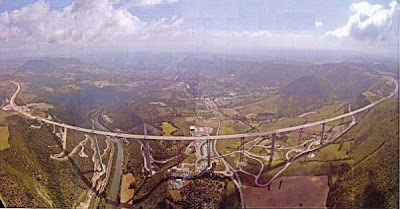 The Millau Viaduct in France is the world’s tallest vehicular bridge. In 2004, after 17 years of planning and work, it was finally completed and formed the missing link in the A75, connecting Paris and Perpignan. Cost: Euro 400 million, but that should be recovered fast at a cost of €3.09 for bicycles, €5.50 for cars and €27.50 for trucks (off season). However, according to the web site, the route saves more than one hour when travelling from Paris and almost €50 in tolls. The state-of-the art construction required 85,000 m3 of concrete and used the latest techniques like laser, GPS, sliders, self-climbing formwork, specific surface coats and high performance concrete. 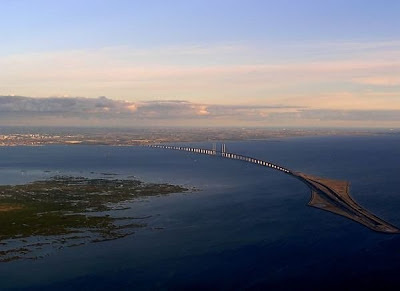 The Oresundbridge (official name: Øresundsförbindelsen) connecting Copenhagen in Denmark and Malmö in Sweden leaves one puzzled, as suddenly a 4-line highway and a 2-track railway seem to disappear into the sea. Is it a bridge? Is it a tunnel? It’s both, making it, what, maybe a brunnel or a tridge? In any case, it’s definitely the longest combined road-and-rail bridge in Europe. Plans for a bridge at this location had been in the works for the last hundred years but it was finally opened in July 2000, bringing Swedes and Danes closer together and increasing tourism. 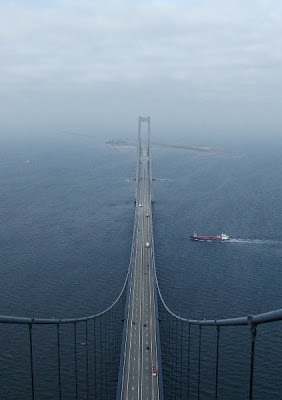 The bridge is 8 km long, plus there’s 4 km of tunnel and another 4 km of the man-made island Peberholm; altogether a stunning, 16-km-drive. 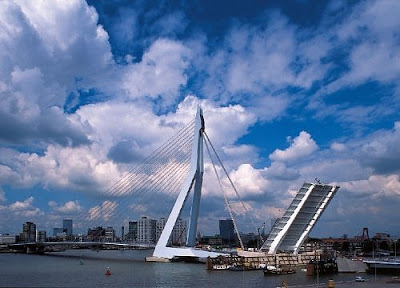 The Erasmus Bridge in Rotterdam does not need to hide behind the Oresundbridge as it can boast a record of its own: its southern part is the largest and heaviest bascule bridge in Western Europe and has the largest panel of its type in the world, allowing tall ships to pass. The bridge is nicknamed “The Swan” because of its 139 m high asymmetrical pylon that overlooks the city like the graceful neck of a swan. 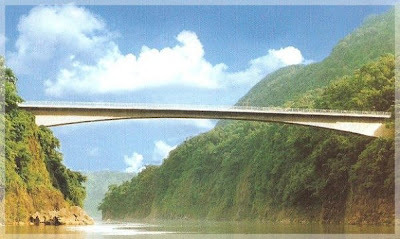 Leaving Europe to move further east, we come to the Indian Jadukata Bridge in Ranikor in the West Khasi Hills District of Meghalaya, 130 km from its capital, Shillong. This bridge over the Jadukata river is close to the Indo-Bangladesh border and therefore a vital link on an important road in this border state. Even cost wise, compared to the other bridges featured here, it is a lightweight at €1.5 million. Moving further east, here’s the Sutong Bridge that spans the Yangtze River and connects Sutong (Suzhou) and Nantong in China. It shortens the commute from Shanghai to Nantong, making ferry service superfluous and heightening Nantong’s importance as part of the Yangtze River Delta economic zone. 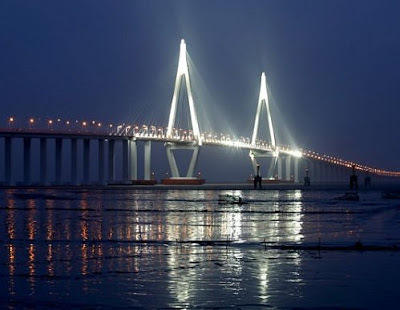 The opening of the bridge in May 2008 has brought foreign investments to the city and spurned the development of poorer northern Jiangsu regions. No wonder, with a status project that cost €1.3 billion. 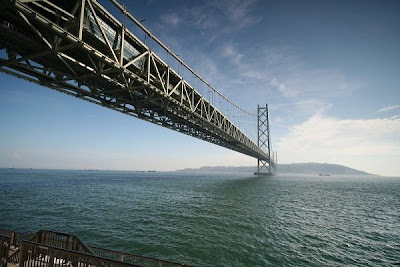 Moving yet further east, we reach the Akashi Bridge (also Akashi-Kaikyo or Pearl Bridge) in Kobe, Japan. 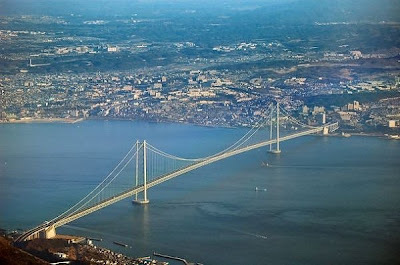 With a centre span of 1,991 m, it is the world’s longest suspension bridge and links Kobe with the mainland of Honshu. Since the bridge’s opening in 1998, crossing the Akashi Strait has become much safer as the bridge has been built to withstand strong winds, sea currents and earthquakes. Before then, passengers used to rely on ferries that were prone to accidents due to severe storms in the region. Last but not least, moving yet further east around the globe, we reach a humble walking bridge in Redding, California. 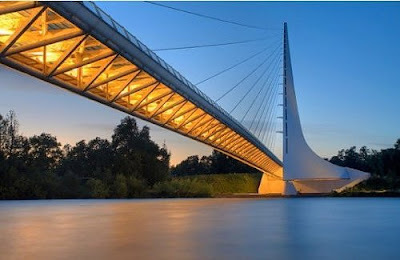 The stylish Sundial Bridge across the Sacramento River is a glass-bottom bridge that connects a network of walking and biking trails. The requirement before planning the bridge was that it could not cast too much shadow over the river as Turtle Bay happens to be one of the best salmon spawning places in California. Therefore, the design is light and airy. Opened in July 2004, the bridge’s construction cost €17.4 million. For all those inspired by these beautiful bridges around the world, there is good news: most of the bridges portrayed have their own web sites (brochures are so 20th century) with lots more information and virtual tours. 11 Interesting Facts about Tigers - Did You Know? 5 Interesting Facts About Pencils - Did You Know?